GLENWOOD SPRINGS – Two back-to-back, drought-plagued winters in Western Colorado have triggered an agreement to “relax” a senior water rights call on the Colorado River at the Shoshone Hydro Plant to allow water providers to store more water this spring, a move that benefits Denver Water and the West Slope. 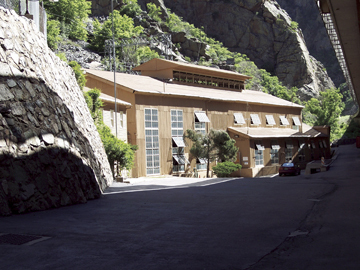 The Shoshone Hydro Plant is owned by Xcel Energy and is located in Glenwood Canyon. Its senior 1902 water right of 1,250 cubic feet a second, or cfs, when called, is administered by the Colorado Division of Water Resources against junior water storage rights upstream that include Denver Water’s Dillon and Williams Fork Reservoirs, the Colorado River District’s Wolford Mountain Reservoir and the Bureau of Reclamation’s Green Mountain Reservoir. The agreement “relaxes” the call to 704 cfs when river flows are low, or takes a Shoshone call totally off the river when flows are rising, which is the current situation. This practice gives the upstream juniors water rights holders the ability to store water once the spring runoff begins in earnest. Currently, the Colorado River is flowing through Glenwood Canyon at about 825 cfs. (The long-term historical average for this date is about 1,150 cfs). Two tripping points activate the agreement: When Denver Water forecasts its July 1 reservoir storage to be 80 percent of full or less, and when the Colorado River Basin Forecast Center predicts spring runoff flows at Kremmling in Grand County will be less than or equal to 85 percent of average. Currently, the reservoir forecast is 74 percent full on July 1 and the Kremmling forecast is 60 percent of average. Denver Water has already enacted its Stage 2 Drought Restrictions to limit outdoor water use and enact other conservation measures. The winter of 2012 was the fourth worst on record in the Colorado River Basin, and 2013 has been tracking just as poorly. The only improvement between the two winters occurred in March 2013 as storms continued to build snowpack. By this time in 2012, runoff was already under way. The relaxation period is between March 14 and May 20, in deference to boating season on the river and irrigation needs in the basin. As for the water that Denver Water gains by the relaxation, 15 percent of the net gain is saved for Xcel Energy power plant uses in the Denver Metro Area and 10 percent is delivered to West Slope entities yet to be determined by agreement between Denver Water and the Colorado River District.